Today, March 1st, I released my first graphic novel. It is now known as Rooster Rumble Fight Club. It's in english and it is 206 pages long. It includes bonus content like Alternate ending, Creator Commentary Track, Page thumbnail sketches, and a How to design your RRFC member video tutorial. It is available in iBooks and Gumroad. You can also find a link to it on the top right of this site at the Buy my graphic novel button. Gamekocks from all over the world come to compete for honor, glory and legacy. This is the story of Jonny, a young and inexperienced fighter who wants to join the club and become the champ. He travels to the Big City to find McCluck, a veteran fighter who has lost his direction. 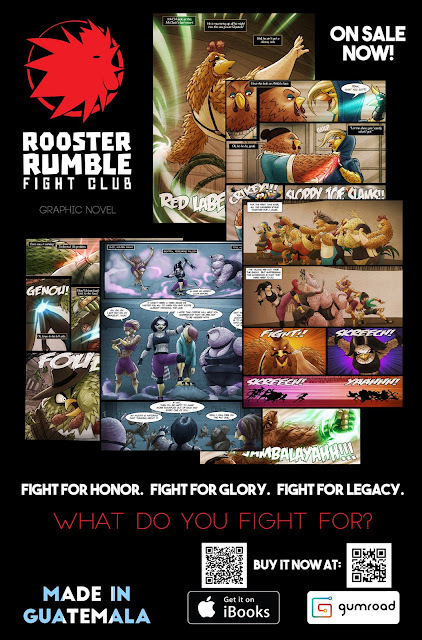 After two fighters mysteriously go missing, Jonny and McCluck soon discover the horrible truth behind The Rooster Rumble Fight Club. It is an action-filled story with great characters that is about the fight to redeem a heart filled with empty promises. What do you fight for? It was one of the hardest projects I have ever done. I thank God for giving me the resilience to finish it. I almost quit a few times during the process but the idea would not leave me alone as I worked on other things. I tried to rush through it a few times but that was not to be. I can only say that it is worth fighting for your dreams. If you have an idea for a story you want to create, don't waste time wondering if it is going to sell or if people will like it. You can never know. There are no formulas for this thing. There are rules and guidelines but these can be bent or broken to serve you better. Make your own rules. Tell a story that you would love to hear and that you feel others should hear. You will learn a lot during the process and you will get the confidence to take on bigger and harder challenges. If you want to create your own comics or graphic novels, the only advice I can give you is, start small. Start with that particular scene you have in your head. Start working out how the scene will start. Sketch it out. You will come up with better ideas as you work it out. Cause the most wonderful thing about working on your own projects is figuring it out. Coming up to an obstacle and figuring out how to get around it. I wish you the best of luck with your projects and that you can see them through to the end. I am very much happy for providing the amazing technology is visible in this log. This is very much satisfied by the great services in this website and using the great services in this blog. Interesting info is visible in this blog and this is providing the unique technology is visible in this blog. for more graphic designs such as resume template, CV Design, and so on.